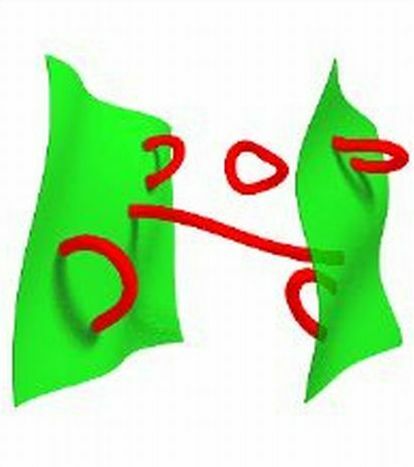 I’m busy dealing with the challenges of being in a quantum superposition, but you’ve probably heard: BICEP2’s paper is now published, with some of its implicit and explicit claims watered down after external and internal review. The bottom line is as I discussed a few weeks ago when I described the criticism of the interpretation of their work (see also here). But no one, including BICEP2, can say for sure whether it is due to ancient gravitational waves from cosmic inflation, or to polarized dust in the galaxy, or to a mix of the two; and the BICEP2 folks are explicitly less certain about this, in the current version of their paper, than in their original implicit and explicit statements. And we won’t know whether it’s all just dust until there’s more data, which should start to show up in coming months, from BICEP2 itself, from Planck, and from other sources. However, be warned: the measurements of the very faint dust that might be present in BICEP2’s region of the sky are extremely difficult, and the new data might not be immediately convincing. To come to a consensus might take a few years rather than a few months. Be patient; the process of science, being self-correcting, will eventually get it straight, but not if you rush it. Sorry I haven’t time to say more right now. It’s been a quiet couple of weeks on the blog, something which often indicates that it’s been anything but quiet off the blog. Such was indeed the case recently. For one thing, I was in Canada last week. I had been kindly invited to give two talks at the University of Western Ontario, one of Canada’s leading universities for science. 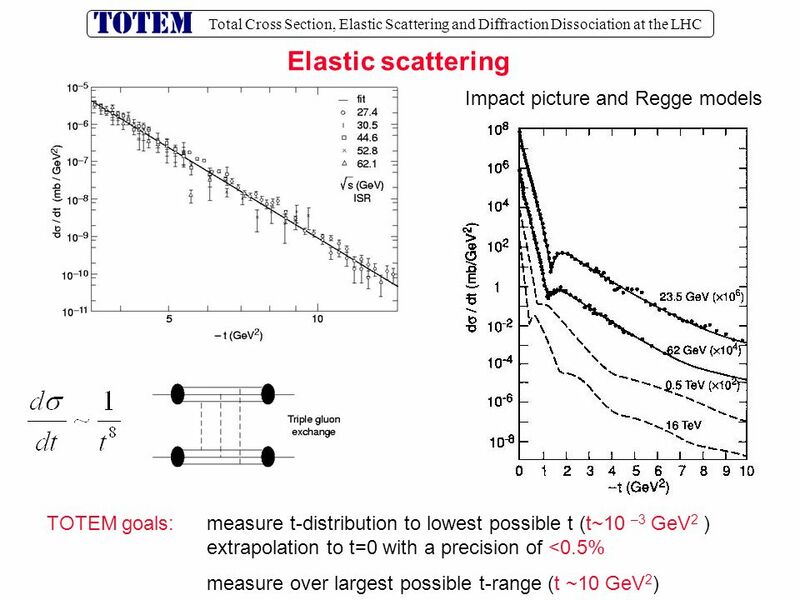 One of the talks, the annual Nerenberg lecture (in memory of Professor Morton Nerenberg) is intended for the general public, so I presented a lecture on The 2013 Nobel Prize: The 50-Year Quest for the Higgs Boson. While I have given a talk on this subject before (an older version is on-line) I felt some revisions would be useful. The other talk was for members of the applied mathematics department, which hosts a diverse group of academics. Unlike a typical colloquium for a physics department, where I can assume that the vast majority of the audience has had university-level quantum mechanics, this talk required me to adjust my presentation for a much broader scientific audience than usual. I followed, to an extent, my website’s series on Fields and Particles and on How the Higgs Field Works, both of which require first-year university math and physics, but nothing more. Preparation of the two talks, along with travel, occupied most of my free time over recent days, so I haven’t been able to write, or even respond to readers’ questions, unfortunately. I also dropped in at Canada’s Perimeter Institute on Friday, when it was hosting a small but intense one-day workshop on the recent potentially huge discovery by the BICEP2 experiment of what appears to be a signature of gravitational waves from the early universe. This offered me an opportunity to hear some of the world’s leading experts talking about the recent measurement and its potential implications (if it is correct, and if the simplest interpretation of it is correct). Alternative explanations of the experiment’s results were also mentioned. Also, there was a lot of discussion about the future, both the short-term and the long-term. 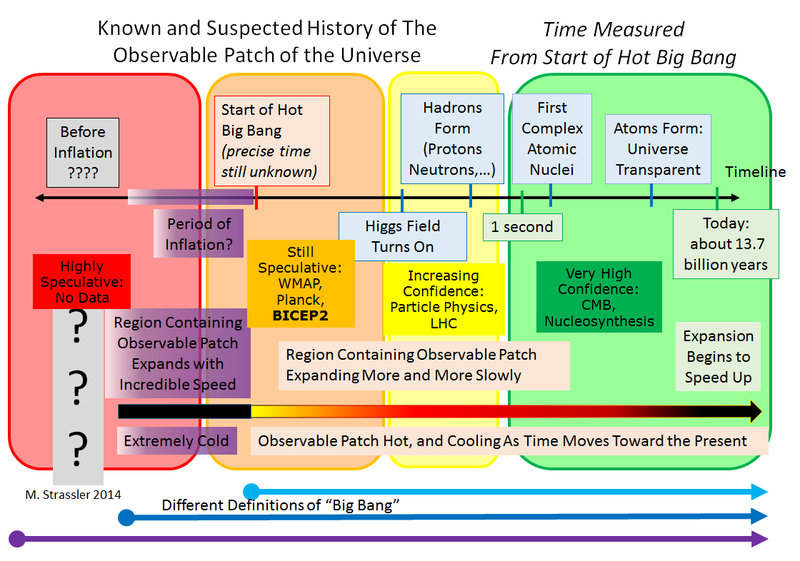 Quite a few measurements will be made in the next six to twelve months that will shed further light on the BICEP2 measurement, and on its moderate conflict with the simplest interpretation of certain data from the Planck satellite. Further down the line, a very important step will be to reduce the amount of B-mode polarization that arises from the gravitational lensing of E-mode polarization, a method called “delensing”; this will make it easier to observe the B-mode polarization from gravitational waves (which is what we’re interested in) even at rather small angular scales (high “multipoles”). Looking much further ahead, we will be hearing a lot of discussion about huge new space-based gravitational wave detectors such as BBO [Big Bang Observatory]. (Actually the individual detectors are quite small, but they are spaced at great distances.) These can potentially measure gravitational waves whose wavelength is comparable to the size of the Earth’s orbit or even larger, which is still much smaller than those apparently detected by BICEP2 in the polarization of the cosmic microwave background. Anyway, assuming what BICEP2 has really done is discover gravitational waves from the very early universe, this subject now a very exciting future and there is lots to do, to discuss and to plan. I wish I could promise to provide a blog post summarizing carefully what I learned at the conference. But unfortunately, that brings me to the other reason blogging has been slow. While I was away, I learned that the funding situation for science in the United States is even worse than I expected. Suffice it to say that this presents a crisis that will interfere with blogging work, at least for a while. If It Holds Up, What Might BICEP2’s Discovery Mean? Well, yesterday was quite a day, and I’m still sifting through the consequences. First things first. As with all major claims of discovery, considerable caution is advised until the BICEP2 measurement has been verified by some other experiment. Moreover, even if the measurement is correct, one should not assume that the interpretation in terms of gravitational waves and inflation is correct; this requires more study and further confirmation. The media is assuming BICEP2’s measurement is correct, and that the interpretation in terms of inflation is correct, but leading scientists are not so quick to rush to judgment, and are thinking things through carefully. Scientists are cautious not just because they’re trained to be thoughtful and careful but also because they’ve seen many claims of discovery withdrawn or discredited; discoveries are made when humans go where no one has previously gone, with technology that no one has previously used — and surprises, mistakes, and misinterpretations happen often. Then — IF BICEP2’s results were basically right and were being correctly interpreted concerning inflation — what would be the implications?